We know you guys love band love stories, so today we want to share with you a new one that we know you'll really enjoy. Earlier this season we traveled to Iowa City to visit the Hawkeye Marching Band at the University of Iowa. During our trip we were able to share with the band world that their Drum Major, Isaac Anderson would be passing the baton during the game to the band's first ever female Drum Major in the modern era, Analisa Iole. It was quite unique to have a Drum Major hand over the baton mid season, but you'll understand why soon. Isaac was leaving the band because he had been assigned for active duty in the US Army at Fort Benning and had to report to for service immediately following the game. Before that game Isaac gave an inspiring and epic speech to the band that has garnered over 100K views on our page and cemented his legacy as one of the most beloved Drum Majors in the band's history. Well, Isaac did leave the band and reported for active duty. He has been training at Fort Benning and fulfilling all of his obligations in the Army. And while it seemed that he had accomplished everythign he had set out to do so far there was one thing he had his heart set on still. Isaac and his girlfriend Grace have been dating for five and a half years. She is the section leader of the trombone section and an elementary ed major. 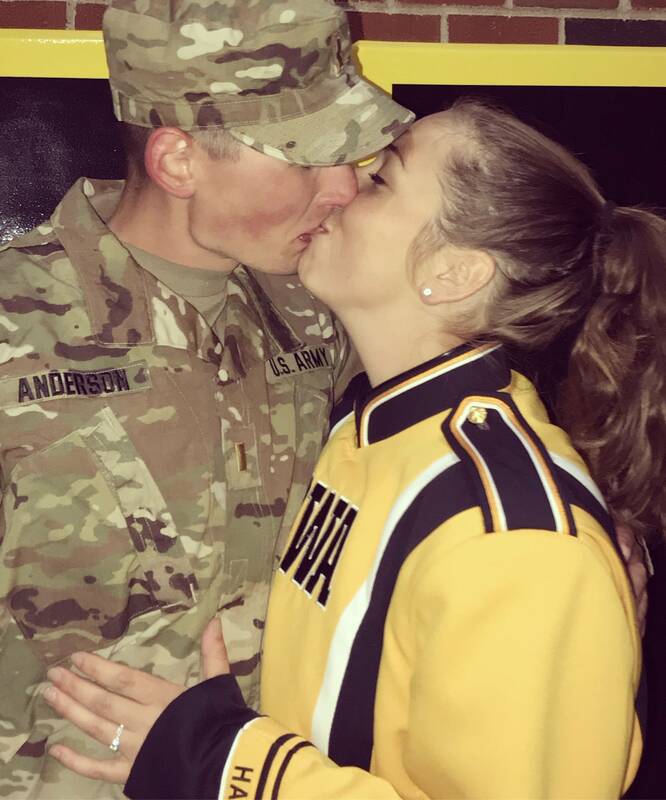 They both marched in the Colts Drum and Bugle Corps together, but their love truly blossomed in the Hawkeye Marching Band. Both of their parents met in band and their dads actually pulled the band trailer together. They are the ultimate Hawkeye Band family. At their game this past weekend against Minnesota, Isaac surprised Grace and flew up from Georgia to propose in what can only be described as an absolutely adorable bandtastic moment. With the band secretly in on the whole thing, Isaac snuck down to the band's section during their playing of "Hey Baby" and popped the question. I'm not crying, you're crying!! Well done Isaac! We wish you both a lifetime of happiness and love and thank you for your service!